So without much real explanation from me, here is the details on the limited edition of Fable III. Lead a rebellion, start a revolution, and rule a kingdom in “Fable III”. Microsoft Game Studios and Lionhead Studios present the thrilling new chapter in the “Fable” franchise exclusively on Xbox 360 and Windows. Action, drama, adventure and humor propel the story as players choose their journey to become King or Queen of Albion. · A new quest: Uncover the mystery of the haunted forests of Silverpines and earn the legendary sword, Wolfsbane, deadly against wolves and balverines. · Exclusive location: Unlock a new region, ideal for settling down with a family and discovering new treasures. 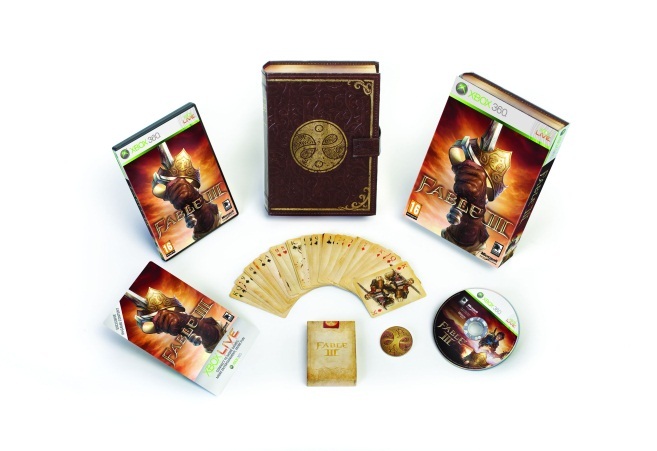 · “Fable III” playing cards: Created by Lionhead, these cards depict every type of character in “Fable III,” including Heroes, royals, rebels and villains from across Albion and beyond. · Guild Seal Coin: The coin features a Good side (blue) and Evil side (red) to assist players in making critical decisions that will impact the fate of the world forever. · A new dog breed: Renowned for its loyalty, the Boxer is a brave canine companion worthy of greatest Queens and Kings. · One unique outfit: Unearth one male and female outfit from the mysterious, faraway land of Aurora, a new destination in your “Fable III” adventures. 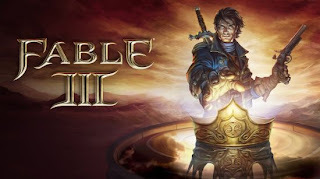 “Fable III” sets the stage for an unparalleled action and adventure experience, in which you will be called upon to rise from revolutionary to ruler of Albion. The choices and sacrifices you make while fanning the flames of revolution, and then as you rule as King or Queen, will lead to an ever evolving world of consequences that will be felt across your entire land." Thats one hell of a good value for money set, and damn hell I will be reserving mine asap. Can't wait for it, and some amazing content! Will keep you posted everyone. (Veldrin) Can not wait for this! I am damn sure getting this limited edition! Thanks for the updates Brennon.